Peaceful sleep and focus are hard to get by in this digital age. Whenever we are in stress, it can be harder to put your mind to sleep. White noise can solve this problem by making your mind to focus on those different white noise frequencies. In this process, your mind eventually puts you in a sleep mode. There are plenty of white noise apps that can be useful for this task. 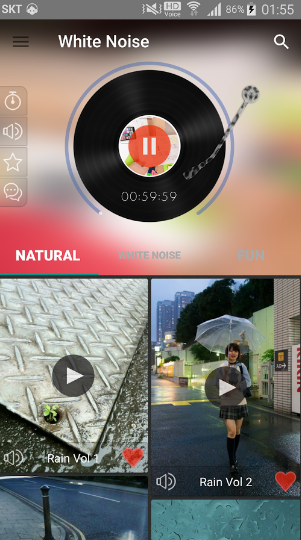 In this article, we discuss we review some of the good white noise apps for Android. When you are dealing with a lack of sleep issue, It's harder to focus on your other parts of life. This problem can be solved with mindfulness and white noise. Though mindfulness and meditation can be useful against stress. But to get a peaceful sleep, you can benefit more from white noise than meditation. It is a mix of different frequency signal with equal intensity. This type of sound helps our brain to get relax and set some focus. It can be used to get your mind off stress. Also, it takes some focus outside your current set of thoughts. This can be very handy when you are having a hard time trying to get to sleep. White noise is also useful when you are under some sort of stress. If you let it work on you, it can do wonders to your sleep pattern. It can also get you to sleep for long. 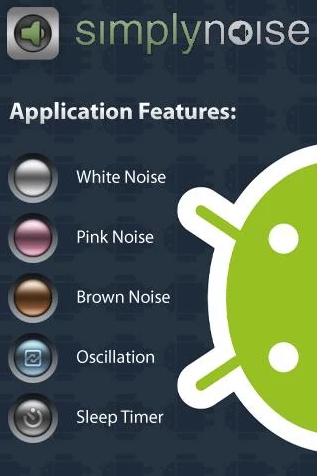 Here are some of the white noise sleep apps that you can find on Android play store. This is one of the best premium apps out there for white noise. They have some free sounds on their official website. And now they have released the premium app through Android and iOS market. They have three types of sounds in their library - white, brown and pink noise. For white noise, you may find waterfall, rain and thunder sound. Also, there are few other variations of sounds too. You can also use the slider to adjust the different frequency of sound to be mixed in. You can also set the timer for the sleep and let the app stop after that. The app doesn't cost much and it's only 99c. So anyone who has budget to purchase app can definitely take a look at this app. This app seems to be focusing it's functionality around improving sleep, concentration and stress. So you can use the timer inside the app for listening to different white noise. You can set the different background for the noise. You can set specific sound as favorite and listen to it quickly through option. There are also natural sounds that you can listen and few fun sounds too. Fun sound category has some of the atmospheric sounds. In case of natural sound, you'd find rain and waterfall type white noise sounds. So they can be really good to listen when you are going through stress. This app has three options - Healing, Meditation, Relaxation. Depending on your choice you can listen to specific sounds. 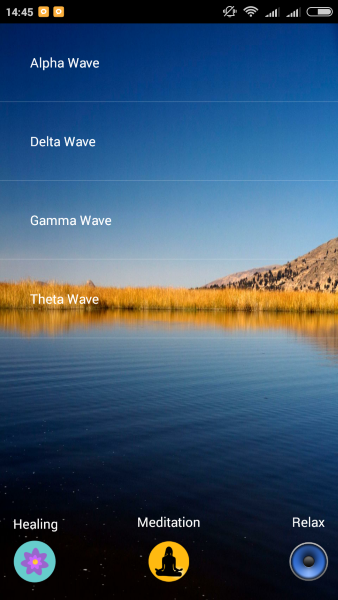 In case of healing option, you get the white noise of type - alpha, delta, gamma and beta waves. These sounds of specific frequency can be good for sleep and the hypertension. In case of meditation, you have different types of bell sounds and Tibetan bowl sound. In relaxation option, you have founds from ocean, jungle, night and rain. The app is free to download and there are no ads in it as of now. For those who want good sounds for their meditation routine, this can be really good sound. 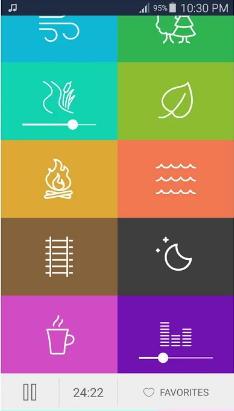 This app is more focused on meditation and relaxation through white noise sounds. It allows you to setup a timer for each session. You can also listen to sounds in loop. Alternatively you can choose various set of sounds. It has HD quality sounds with good background. You can also customize your own set of sounds. Some of the sounds can be good for productivity improve and sleep pattern improvement. Though a lot of sounds are not up-to the calm quality. But the app is free and considering most of the premium sounds costs a lot. I think the app is good enough for relaxation and meditation. One of the best app out there for stress reduction. It has different set of sounds that you can listen to while viewing the animated background. It has sounds from different environment such as - beach, jungle, clouds, rain etc. For premium subscribers the app also allow you to have subscription to various guided sessions. You can check out the free preview of those sessions. Mindfulness and Stress relief program are definitely worth following. There is also free option of meditation session. Though premium subscription may not suit for all as it is priced 9$ per month. 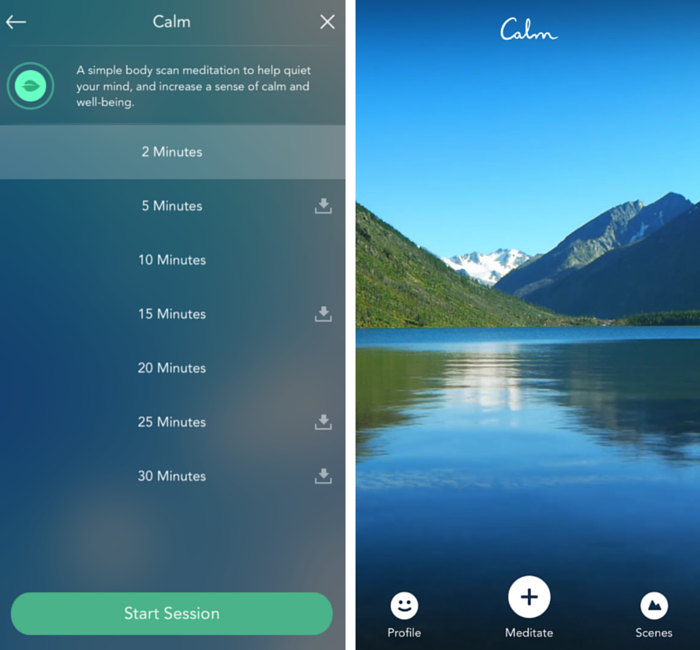 However if you're in need of guided session of meditation and stress relief then this is the app to use. At the end, you can see there are countless apps out there that can be used to listen to white noise. However very few apps have sounds that are effective enough for the sleep improvement and stress reduction. The apps listed above can be useful if you are looking to listen to white noise.